A Beautiful Ruckus: $100 Melissa and Doug Giveaway! 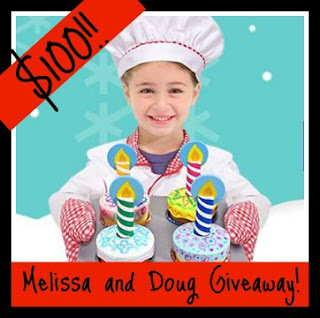 $100 Melissa and Doug Giveaway! Okay, y'all. This is really exciting! Do you remember the Melissa and Doug Terrific Twenty Giveaway from a few weeks ago? It went really well. I mean, really well. 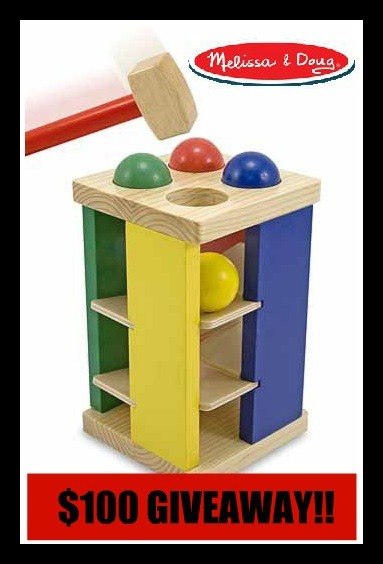 So well that I got another email from the Melissa and Doug company last week. How would you like to finish your Christmas shopping without having to leave your couch? Melissa and Doug has offered to give away $100 worth of toys to one A Beautiful Ruckus reader! If you win, you can chose from anything on the website! Anything! And on top of that, they have also offered to cover the shipping of the items that you chose. So if you win, that's $100 worth of your favorite items from their site with free shipping! These toys are awesome! High quality, durable, and educational, they will last through a lot of playing and still look good on the other end. Personally, I really love the range of wooden toys that they offer, because I can easily see those sticking around for my grandkids. Normally, I just look for items that will last until our quadruplets are finished with them...it's nice to think these will be around even longer! In fact, a box came just yesterday with the Melissa and Doug Whittle World Wooden School Bus Set for our kids. I can hardly wait for Christmas morning! What is my favorite feature of the website? I love being able to sort the toys by age with a simple click of the mouse. Since it's sorted by age/skill level, it makes it easy to find learning items for little guys and more crafty items for older kids. With 2000 items on the site, there is literally something for everybody. And a lot of them can be personalized! I'm also excited about their great Toy and Birthday Club! If you sign up, you get 10% off of your first order and 15% off in the month of your child's birthday. I love birthday discounts...especially when the discounts are for really nice toys that my kids will love! So, how would you spend $100 on the Melissa and Doug site? Get your name in the hat by entering below!! The contest ends at 11:59pm on Tuesday, December 4th. The winner will be announced and contacted by email on Wednesday, December 5th. The winner will have 48 hours to respond to the email with their information so that the prize can be forwarded to them. A Beautiful Ruckus is not responsible for the delivery of the prize and is not responsible if the sponsor does not deliver. This giveaway is open to residents of the United States. A Beautiful Ruckus received no compensation for hosting this giveaway. For further information, please see my disclosure page. I love the train sets. I love their truck and car sets (I guess I should say my son does :) ) but we are getting my son a kitchen for Christmas so I would love to get him some of their play food sets. The ice cream play set looks great! I love the Stacking Train Toddler Toy! We love all Melissa and Doug Toys! My son would love the wooden train that stacks! My kids love all the wooden food sets! We absolutely love the cars and trucks. Basically anything from them!! We want to get the Owl stacker as well, my daughter loves owls and stacking! We have several Melissa & Doug toys and they're awesome! I know my boys would love the "Musical Instruments Sound Puzzle," the "Stacking Emergency Vehicles," and the construction ones too! I would also like them to try the "Lace & Trace Shapes," (they LOVE stop signs! ), the "Magnetic Pattern Block Set," and the "Magnetic Picture Maker." So many great toys to choose from! -Rustie D.
I love their food toys! We LOVE their puzzles!! What a great giveaway! I LOVE M&D! One of the things on my wishlist for my boys is their giant stuffed dalmation - for their firehouse-themed room!! My nephew and niece LOVE Melissa and Doug toys! There is a bowling set I would love to get Grant. Pick me, pick me, pick me!!! There are so many Melissa and Doug items on my kids' Christmas list, it crazy!! LOVE the puppet theatre! -Fallon C.
We love all the puzzles. Great quality and can handle the rough and tough of my twins. We don't have and M&D toys yet. I think I would start with some puzzles and some cars. My poor boy doesn't have enough cars. I guess that's what happens when you're born between two girls! My son loves the Melissa and Doug trucks! We also want to latch board puzzle! I love the metal shopping cart. My daughter would love it. My son would love the train table with trains. Would love the train table for my kids! I would love to get my daughter their mailbox. She would love it. i love their magnetic calendar. I love Melissa and Doug and so do my kids. They are a big fan of their giant sticker books and magnetic doll sets! I love the play food sets, especially the sushi! I would love to get my little grandson a Trunki to pack his clothes in when he comes to visit Grandma. How exciting! M&D toys are my favorite for our kids! I love the train sets, my grandson loves trains! i like all of their food sets and their mailbox. Katie loves the kitchen/food play sets. The fridge and pantry sets would be great for Christmas. My favorite is the Rattle Rumble Toddler Push Toy. We have a Melissa and Doug kitchen, but no food! I'd love the food play sets with the full set of pots and pans! I would love to get the ABC puzzle for my almost 2 year old, she LOVES puzzles now. And some supplies for their kitchen. Cooking/shopping is the favorite thing to do in the play room now. I want to try the wooden food! My kiddos would love it! I'm excited about the Scratch Art Portable Light Box! I would like to try the Rattle Rumble Toddler Push Toy. Their furnished doll house would be nice to have. The Big Rig Building set! I'd love to get this http://www.melissaanddoug.com/multi-level-solid-wood-dollhouse for my little girl. I'm excited to try the Big Rig Building Truck Wooden Play Set. My son would just love it! I like the wooden play food - food groups. the stuffed animals look so soft for babies! I would definitely want to get the pizza party toy for my oldest daughter. She played with it at a friends house and didnt want to leave. I like the Spill and Fill Toolbox would be great for my son who is almost one! Hard to choose, but the tea set is adorable! I want to get Aly the doll house :) Not sure if in-laws can enter your giveaway but I am throwing my hat in the ring, just in-case! I would love to get my daughter a Trunki! I like the play food. I would love to try any of the train sets. We love all Melissa and Doug toys. My kids really love the puzzles right now. Car Carrier Truck and Cars wooden toy set. Love all Melissa and Doug stuff especially the puzzles! Art stamp set and other great things in the arts and crafts section! We would like to buy the train table. I like the Cook's Corner Kitchen with FREE Let's Play House! Grocery Cans. The fold and go castle! I like the Big Rig Building Set. My 2 year son was recently diagnosed autistic and since then we have been seeing an occupational therapist and a special ed teacher. Once thing that I have noticed with him while working with the OT and the teacher is that he cant let go of the Large shapes jumbo knobs puzzle (and any other jumbo knob puzzle). They have so many neat toys! I looove the giant lion stuffed animal as well as the giraffe! So many choices! I'd pick puzzles or anything with "tools." My almost year old son would love so many things! My son is 10 months and I'd love to get him one of the many wooden puzzles. We don't have any puzzles for him yet. I would love to get the Fold & Go Castle for my boys. My daughter would love the Shopping Cart with FREE Let's Play House! Grocery Boxes! I'd like to get the Trunki for my niece. Beginner Band Set is one of my favorites. I think my daughter would LOVE the first bead maze! I really like their line of dress up clothing. The super hero and heroine costumes would be much appreciated by my three kids. The Rattle Rumble Push Toy is on the top of my list! I like My Own Mailbox. The quality of these toys look amazing! I love the puzzles and the trunki! I like the Victorian Dollhouse. I would buy the sushi food set and food groups play set for my nieces! I love the Folding Horse Stable! I want to get the mailbox for my kids. The Delux Puppet Theature is so cool! My daughter would love the penguin stacker! I would love the Giraffe Giant Stuffed Animal from Melissa and Doug. Penguin stacker is cool. By the way, I'm already subscribed, so I checked that already. Hope that's ok! I would love the big rig building set. I would LOVE the Puppet Theater! Would love some of the food sets for our kitchen. Thanks. I'd love to try the Chomp & Clack Alligator Push Toy for my youngest! wooden project workbench. It's awesome. I really want to get the bella butterfly tea set for my daughter. I love the Stacking Train Toddler Toy. My oldest son would like the map of the United States puzzle. Let's Play House! Grocery Boxes, thanks! I like the Dress-Up Stickers Roll - Princess & Fairy! I like the magnetic chalk board and dry erase board.